Silda and Eliott Spitzer have officially gone their separate ways, but newly leaked documents reveal that Silda left the relationship with a $7.5 million lump sum, an additional $240,000 a year until she remarries or dies and a strict order not to talk to the press about the relationship. 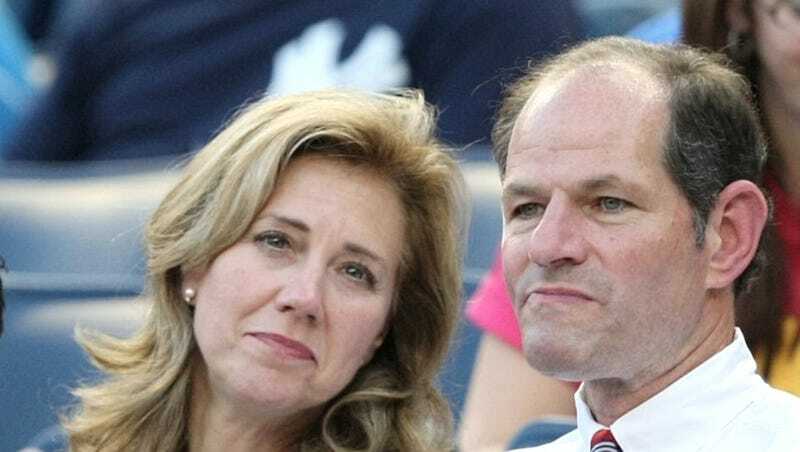 Signed in September and filed in February, the postnuptial agreement papers obtained by Radar Online reveal that Spitzer will be paying Silda's "living expenses at a level sufficient to maintain her current … marital standard of living." This comes out to $1 million within 180 days of their separation, $1 million when their divorce was finalized and the remaining money in $500,000 payments delivered annually for six years. Silda also gets an additional $240,000 a year, though she won't have access to Eliot's bank accounts and he won't be paying her extra child support for their basically grown children. He will, however, be paying for their children's school and associated expenses, health care, etc, as well as Silda's "reasonable accounting needs," a housekeeper, parking, a new car every five years or more, "entertainment and activities expenses," an assistant, vacations/travel and $100,000 every year to give to charity. The large amount of money Silda is getting is due (in part) to the discrepancy in their incomes: in 2012, Spitzer made $4.27 million of the family income while Silda made $112,000. As such, each party agrees that prior to the occurrence of the Operative Event, neither party will use the farm in any way, including choice of visitors, that would cause any of their children emotional distress, unhappiness, embarrassment, hurt or harm in any way. ...each party agrees that from and after the date of this Agreement he or she shall not, or shall not cause his or her other respective agents, attorneys, employees and other representatives, without obtaining the other party's written consent in advance, publish, or cause to be published, any diary, memoir, letter, story, photograph, interview, article, essay, blog, YouTube or like internet video, account or description, whether fictionalized or not, concerning (i) intimate details of their marriage to each other, or any other intimate details of the other's life or (ii) the other's business, professional or financial affairs. As used in the preceding sentence, the term "publish" shall mean the presentation or reproduction of written, verbal or visual material in any communication media, including, without limitation, books, magazines, newspapers, internet, or on-line posting and publications, theatrical publication of any kind, movies, television, or radio, in any language and in any jurisdiction. Nothing herein shall prevent a party from publishing material about his or her own life and experiences or prevent party from discussing and describing his or her children and descendent or expressing pride and happiness in a party's children and descendants. No imitate detail of the parties' marriage or intimate deal of the other party's life shall be deprived of its intimate character because it has been the subject of media attention or other public forum. If they break this agreement, either can be fined between $125,000 and $375,000. The only statement they'll be making: "We regret that our marital relationship has come to an end and have agreed not to make any other public statement on this subject." Good statement/nonstatement.